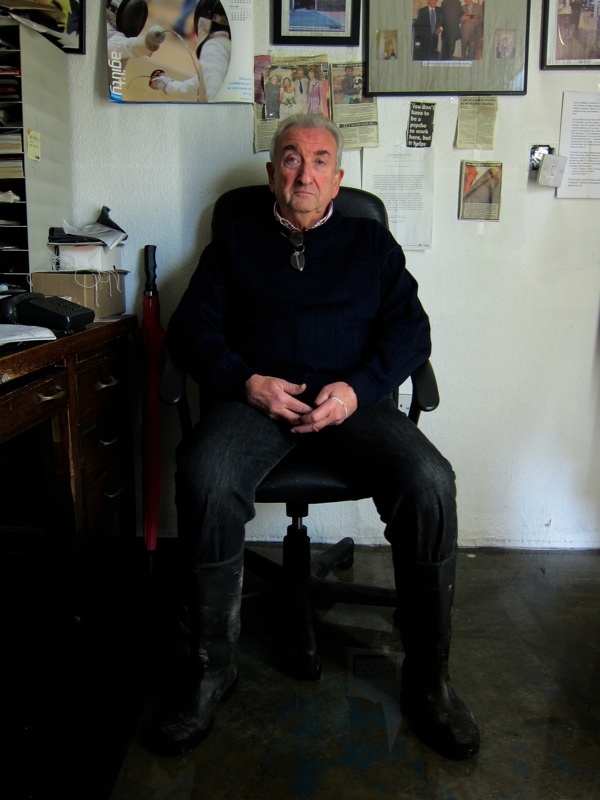 “A lifetime’s work has gone up in smoke” declared Philip Pittack, standing in the ruin of the Quaker St premises where he operated Spitalfields’ last cloth warehouse with his partner Martin White, until the recent conflagration. 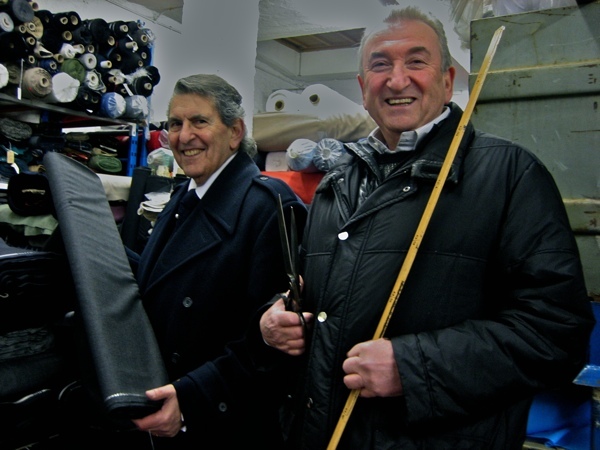 Just two years ago, Philip & Martin were forced to move their business, Crescent Trading, from the old stable across the road and they set themselves up again in their new premises with all their cherished fabrics neatly arranged in metal racks stretching up to the ceiling. Celebrated equally for their ceaseless repartee and their extraordinary bargains, this new calamity is a cruel blow for these two popular gentlemen who, between them, possess over one hundred and twenty years of experience in the trade. 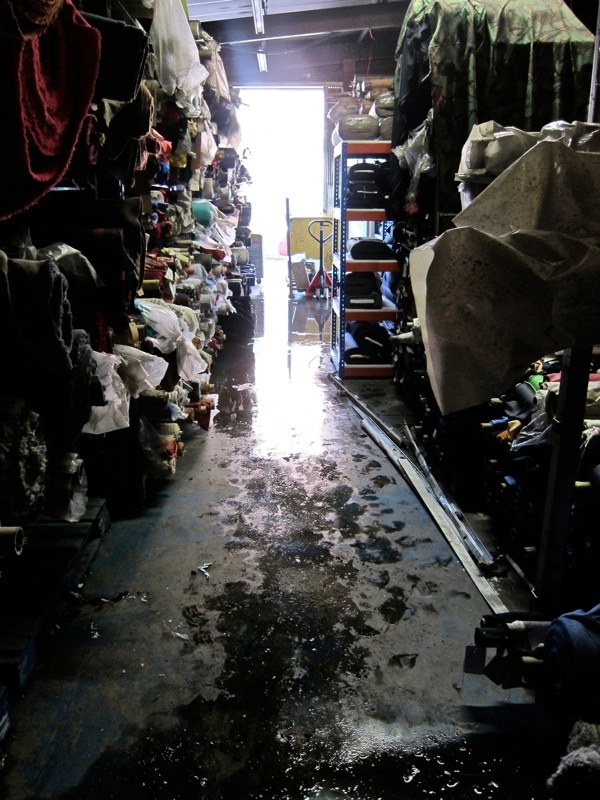 When I received Philip’s emotional phone message, I went round next morning to discover the warehouse flooded and a hole in the roof at the rear where the fire started. Just the night before, Philip recalled – savouring the tender memory – he and Martin had been celebrating at the Mansion House in the City of London, where designs by a student they sponsored were the centrepiece of an evening promoting British wool. Yet next morning, Philip woke to news of a different sort. An electric fire appears to be the cause of the fire which, mercifully, was restricted to the corner of the warehouse, although heat caused the roof to buckle and smoke filled the whole building, permeating the precious rolls of fine suitings and silks. “We’ve had customers coming in and they’ve gone out crying, saying, ‘What are we going to do now?’” Philip confessed to me, wringing his hands in contemplation of the question. This is the beauty of Crescent Trading. There is a joyous rapport that exists between Philip & Martin and the fashion students and young designers who come to discover fabrics and be inspired, delighting in the knowledge and experience on offer that is always dispensed with wit and levity. It is a human exchange that is cultural as much as it is commercial, and it makes all parties happy. Facing such a disaster at this point in their careers, many would expect Philip & Martin to retire. Yet I am delighted to report that their spirit is stronger than this. 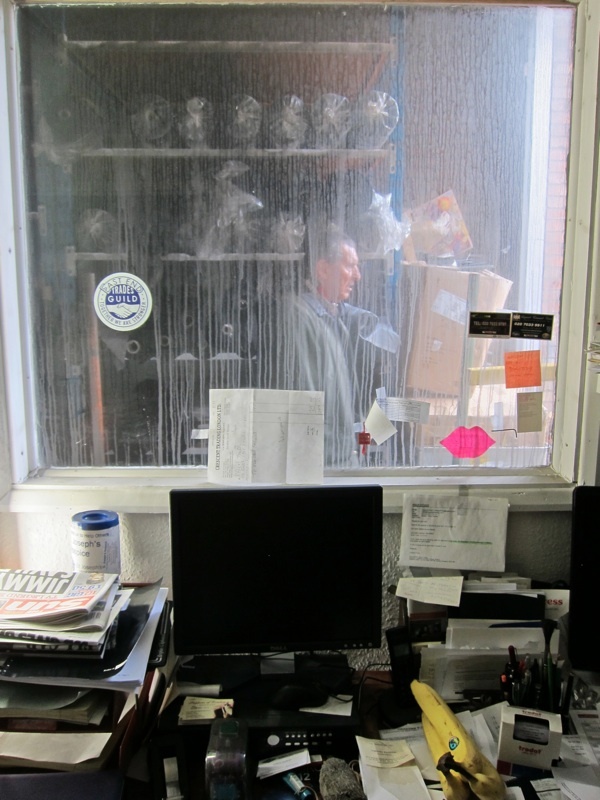 Both worked a lifetime as cloth merchants and come from families that have been in the trade for generations. As soon as it can achieved, they plan to repair the building, clean out the premises and restock. 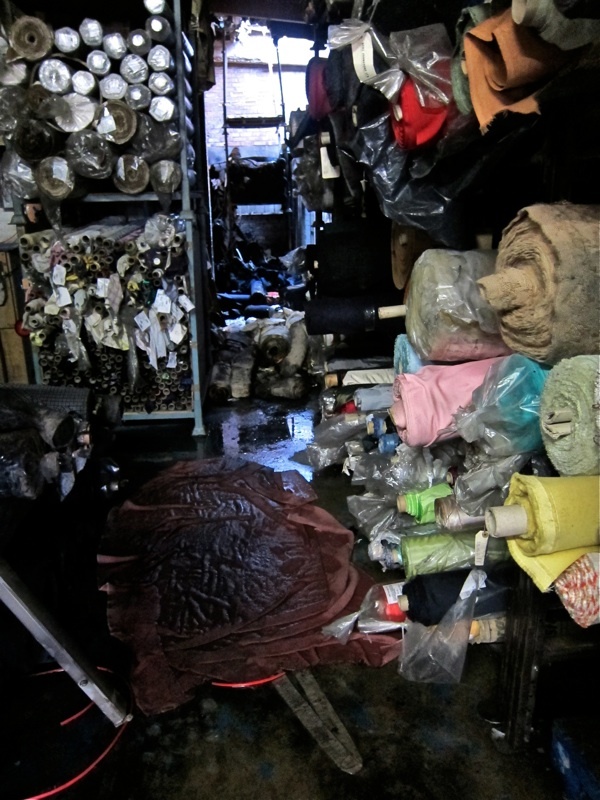 As the last cloth warehouse in Spitalfields, a place that for centuries was filled with cloth warehouses, we need them to carry the living history of the textile industry here. 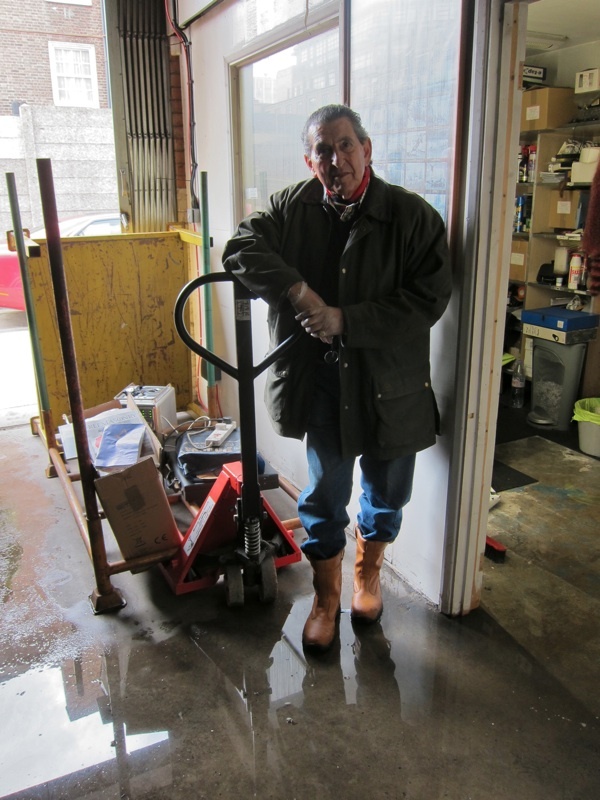 “We’ve been knocked down, but we will get up again and we’ll be back,” Martin assured me. Philip & Martin in happier times. This is terrible news. I send my best wishes to Philip and Martin in their endeavors to get up and running again. Spitalfields desperately needs to retain fantastic businesses like Crescent Trading. I’m sure their loyal customers will back them to the hilt! 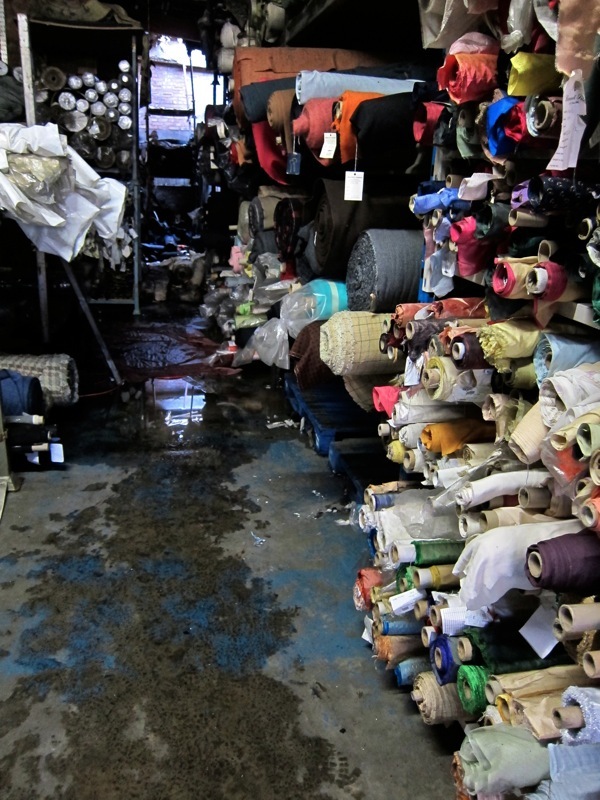 I’ve never had the opportunity to see the fabrics they sell, but the loss off such a respected and loved business is indeed a tragedy. Best wishes to everyone concerned for an energetic and successful return to business. This is terrible news. I’ve recently finished making an Issey Miyake designed jacket from fabric purchased from Phil and Martin and have been enjoying wearing it (and the compliments I’ve been given for it). I wish them every success in rebuilding Crescent Trading. People with this spirit are what London is really all about, and the passing on of value and inspiration to young students is vital, so they can see that this stuff is made, traded, curated. I’ll bring my gf in the States to the shop when she comes over if I may, she’ll love it. May the force be with the re-opening. 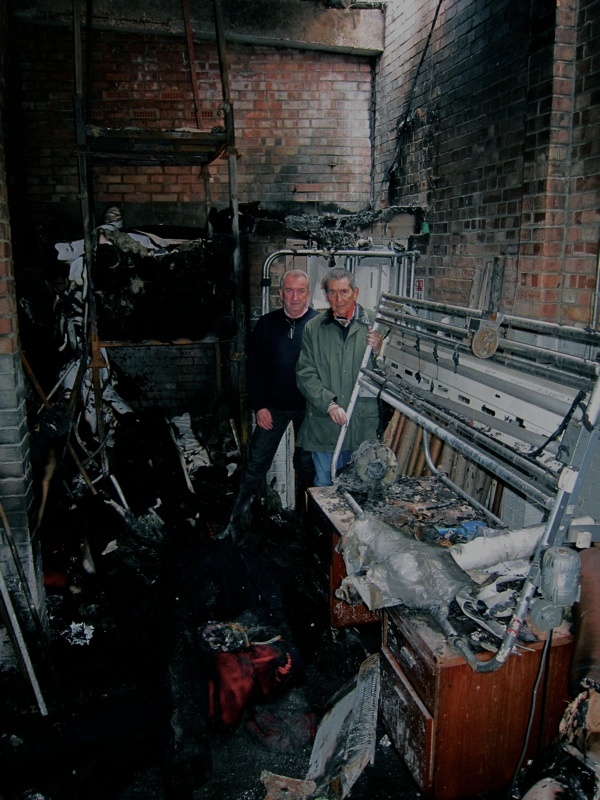 I am very sorry to hear about this devastating fire and wish Philip and Martin the strength and determination they will need to build their business back up again. Here’s to their re-opening. All their hard work gone up in smoke after all these years. Awfully sad news, I had very much enjoyed your previous reports and dreamed of being able to visit one day. My best wishes to Philip and Martin, and I still hope to be able to meet them and see the renewed shop. Was shocked to read the news,most important nobody was hurt. us new shoots,it grows again fitter & stronger. I thank you so much for your heart-wrenching article and you guys for your comments. We may be two old farts but we still have a fire in our bellies! Old Farts are the ones who get things done these days! I wish you the best in rebuilding your business. Shocked at the news, where do we get our supplies from. Philip & Martin the straightest guys in the trade, reliable, honest and reasonable in price. With best wishes for an early return to trading. I’ve never had the opportunity to shop with them, being at the wrong end of the country, but the whole story is heartbreaking (I have tears in my eyes looking at the pictures). Their determination to continue is astonishing. I wish them all the good and luck that anybody could. Looking forward to their reopening ,they have my full support and I hope yours. Such lovely guys, so helpful, Always love going in their, I really wish them lots of luck and success for the future!!! You are an example for a honest fair business!! Ohh. This is very sad news. I’ve purchased many fabrics over the years… I’m so sorry but hope to support you in the future. We had to start from scratch, until the new warehouse was rebuilt. Now 8 years later we have made a good recovery, hope you guys put it together again. Congratulations on your re-opening which I saw this morning on the national news TV. Brilliant publicity for you and I wish you every success with your new phoenix, literally risen from the ashes.